Sustainability as a term is often associated with environmental impact and management. The “E” in “EHS” dominates in sustainability as a strong focus is placed on energy, materials, greenhouse gas emissions and many other topics that fall under the umbrella of “green”. However, sustainability reporting guidelines such as those developed by the GRI (Global Reporting Initiative) puts a strong emphasis on economic and social indicators such as Direct and Indirect Economic Impact, Anti-Corruption, Procurement Practices, Occupational Health & Safety, Human Rights and many others. Health and Safety is a vitally-important discipline defined as “preventing people from being harmed by work or becoming ill by taking the right precautions and providing a satisfactory working environment.” While Occupational Health can be described as “the promotion and maintenance of physical and mental well-being of all staff and the prevention of ill health”. Put very simply, H&S is a pro-active (preventing risk) approach and OH is re-active (dealing with employee health issues as and when they occur). Current discourse suggests that concepts of sustainable design of products and services now also pay attention to worker safety and health in projects and processes. 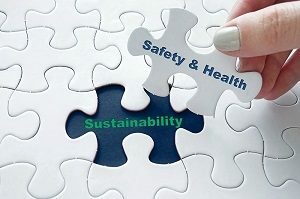 In recent times, linking safety to sustainability is among the key values in organizational culture and business strategy; since there is no doubt that the health and wellbeing of employees in the workplace is of profound importance to workers themselves as well as for the long-term sustainability of the organizations they work for. 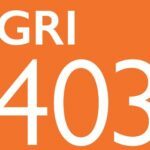 403-1 – Workers representation in formal joint management-worker health and safety committees – mention and description of the committees suggest the strong emphasis paid on ensuring communication of safety-related concerns and addressing them together. When reporting on this indicator it is important to mention the percentage of workers that are represented by these formal joint-management-worker health and safety committees. This does not mean the number or percentage of workers who are in the committees. Example: typically ALL workers (100%) are/should be represented in formal joint-management-worker health and safety committees. 403-2 – Types of injuries and rates of injury, occupational diseases, lost days and absenteeism, and number of work-related fatalities – the tracking of the incidents showcases the organization’s will to document, evaluate and learn from past incidents and more importantly ensure future incidents are avoided. The performance may be represented as it is currently being tracked by the organization as long as the process and system is stated. 403-3 – Workers with high incidence or high risk of diseases related to their occupation – this disclosure is relevant to organizations in sectors/locations where workers are exposed to high risks/ incidents of specific diseases. Measures put in place to prevent serious diseases contribute to lower turn-over rates and greater worker satisfaction. 403-4 – Health and safety topics covered in formal agreements with trade unions –formal agreements that stress on safe working culture ensure that both the organization and its workers are more responsible and committed to safety and its management. For more information, reach out to us on the ECC International Website. Did you like this Blog? Tell us what you think! Until Next time, when we take a look at the Relevance of Anti-corruption to Sustainability.